This story just keeps getting bigger by the day as the Syrian battleground morphs and contorts, contracts and expands by the hour. You have to give it to the Russian military tacticians and war strategists; they have outfoxed their American counterparts at every turn. That Russia would feel so confident in their latest generation of cruise missiles to fire them from 900 plus miles away reveals that the USA lacks the necessary technology to neutralize them. Which means that Russia can continue to prosecute the war against the USA-coordinated terror groups in Syria from their Motherland. This battlefield-shattering tactic also demonstrates President Putin’s resolve to liberate Syria from the Zio-Anglo-American controlled ISIS … even if it must be done from a thousand miles away. Russia has launched rocket strikes on Islamic State targets in Syria from its warships in the Caspian Sea, 1,500km (932 miles) away, Russian Defence Minister Sergei Shoigu says. He said four warships launched 26 sea-based cruise missiles on 11 targets, destroying them. Meanwhile, Syrian ground troops have launched an offensive under Russian air cover, Syrian officials say. 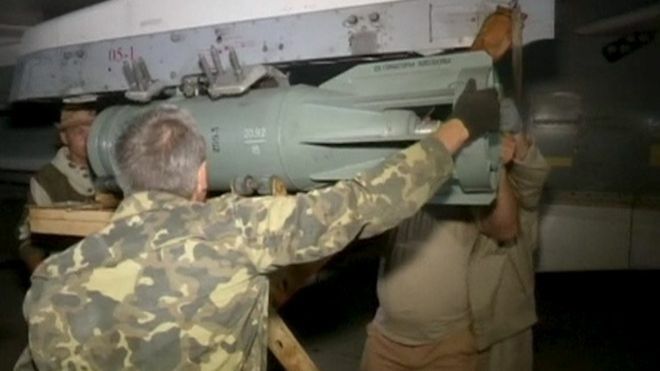 Russia denies claims that its week-long strikes mainly hit non-IS targets. The Syrian Observatory for Human Rights reported “the most intense fighting in months” in Hama and Idlib provinces. The clashes followed a wave of Russian air strikes in the same areas, it said. It appears to be the first co-ordinated offensive since the air campaign by Russia – a staunch ally of Syrian President Bashar al-Assad – began on 30 September. Russia says it is targeting “all terrorists”, but at least some of its air strikes have reportedly hit civilians and Western-backed rebels.